Swing Dance Scunthorpe Summer Party 7:30pm Swing Dance Scunthorpe will be holding their Summer Party with Major Swing & Kitty at Brumby Hall, Scunthorpe on Saturday 6 July 2019 from 7:30pm. Tickets will be on sale in the New Year. SWINGPLANIT SEARCH ENGINE 6:00pm Follow the link to Swingplanit. A search engine for global swing events and socials. Hello and welcome to Kingston Swing's Thursday night group. Thursdays were dedicated to help spread knowledge of one of the fastest growing swing dances in the UK, Collegiate Shag! Currently we are taking a break but will announce on here and our Facebook page when we are back up, so please call back soon. There will be an hours class starting with the footwork and building moves through the lesson. The lessons will cost £4 Lessons are aimed at absolute beginners and will be designed so that anyone can join in any week. No partners are required and comfy flat shoes/trainers are advised. These dances are extremely fun and an enjoyable way of keeping fit. The Collegiate Shag (or "Shag") is primarily a 6 count partner dance performed to uptempo swing and pre-swing jazz music around 185+ beats per minute. 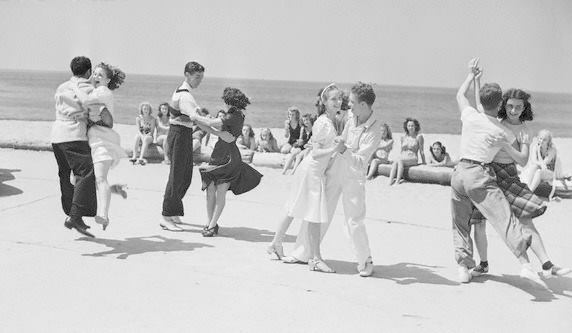 It belongs to the swing family of American vernacular dances that arose in the 1920s and 30s. 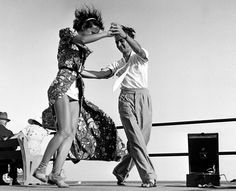 It is believed that the dance originated in the Carolinas in the late 1920s. Kingston Swing are a 'not for profit' organisation and we teach on a voluntary basis. This means all proceeds from the lessons can be reinvested into the group for the benefit of its members. Join our facebook group here : Kingston Swing Shag Thursday for up to date info.